With the 2012 Presidential campaign in full swing, I decided to pull out a political gem from 1999. 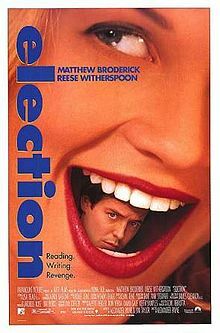 “Election” is a comedy about an annoying little overachiever named Tracy Flick (Reese Witherspoon) and her pursuit to become school president. We all went to school with a Tracy or at least her male counterpart. They are involved in anything and everything to the point of overkill, nobody really likes them and we suspect that they must have a dirty secret or strange quirk that no one knows about. Witherspoon, fresh off the success of “Cruel Intentions”, plays this role perfectly. I suspect it’s because that’s how she really is, but what do I know. Anyways if you pay attention to politics even just a little bit, then you know that campaigns at any level sometimes tend to get a wee bit nasty. Candidates will lie, cheat, steal and even cover up a love child to fulfill their political aspirations. “Election” and Tracy Flick show us that school politics are not immune to the dishonesty of political power plays and backroom deals. Today’s scene is near the end of the movie. We watch as former teacher Jim McAlister (played by Matthew Broderick) spots Tracy Flick while he walks the streets of Washington D.C. Too say that these two didn’t see eye to eye would be an understatement, so when Mr. McAlister sees Tracy's bubbly little face all of his anger returns. He resents that she has ascended to where she is despite her indiscretions back in high school and also for being indirectly involved with him losing his job. So overcome with anger, McAlister does what any mature middle age man would do, he gets pissed and throws stuff. I hope you enjoy the scene and if you haven’t seen the movie I encourage you to check it out. Happy Friday! I have a similar reaction most times I see Witherspoon on screen. Agreed. Legally Blonde & the sequel should have ended her career. Remember her in Freeway? Crazy movie. I don't care for Broderick except for Buehler but I'd like to see this flick again. I think Election is a great movie, and despite her Oscar win for Walk the Line, I feel this is the best performance of Witherspoon's career. By the way, I sometimes recommend a double bill of Ferris Bueller's Day Off and this film to mess with people's heads. Chip Lary- I agree with you. Election is a funny, smart and very well acted movie. In my opinion, the success of Walk the Line was partly because of the 3 year love fest everyone had with Johnny Cash. Never saw WLT on principle alone, but I wasn't surprised that people/critics loved it. They're probably the same people that thought Johnny Cash recorded the original version of "Hurt". I think you're on to something with Bueller & Election.